Mark your calendars for our inaugural Art on Tap Fest!! Thursday, May 2nd from 6-8pm at Big Chill Beach Club. Your favorite breweries and their artists will be competing in a Beer & Art collaboration for YOU to vote on! We’ll have a DIY station set up so you can make your own bottle opener. 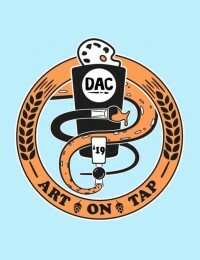 Our DAC artists will also be competing to see who can make the coolest growler. Lots of fun and beer to be had! !